As a conservator I'm continually challenged to blend the old and new; to neither compromise historical integrity nor adversely affect its aesthetic. Conservation techniques today are a mixture of the traditional and the modern, combining the benefits of advanced knowledge and technology with respect for the past. Some challenges however are greater than others, as in the case of a 17th-century French ebony cabinet, the conservation of which I was recently entrusted with. Many pieces of complicated ripple moulding were missing and needed to be recreated. Some of my colleagues have addressed this problem in the past by casting replacement mouldings in black plastic, however I felt my cabinet deserved wood. 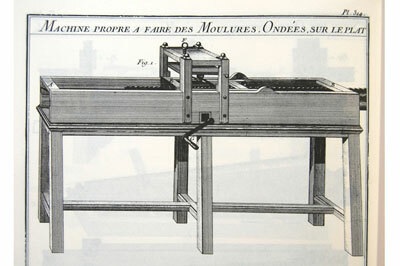 This presented a unique problem, as the complexity of ripple moulding means it's impossible to achieve by hand, and ripple moulding machines have been extinct for at least two centuries. The missing mouldings were particularly sophisticated. The waves had been cut simultaneously in two directions: a vertically moving blade had scraped a wave pattern from above, while the moulding was being physically moved from side-to-side. 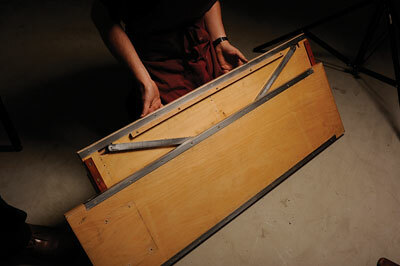 Today there are mechanised production methods that produce commercially available ripple mouldings, particularly aimed at the frame restoration industry. However, these were generally too simplistic and failed to replicate the expression and distinctive artistic style of the real thing. My answer was to reproduce an original machine. Several modern reproductions exist, including machines at Denmark's National Museum and the Bavarian National Museum in Munich, Germany. Amsterdam has a machine built by Cees van Soestbergen in 1997/98. 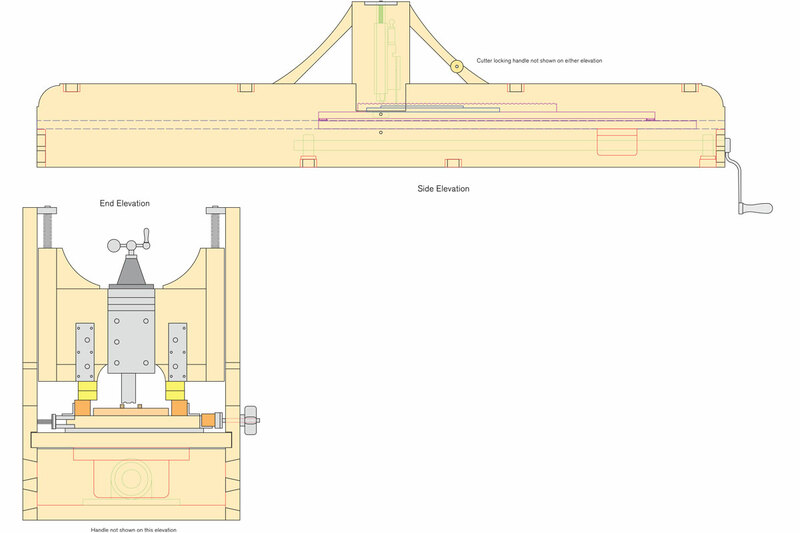 Unfortunately, only a few of those listed above produce two-directional ripple mouldings. 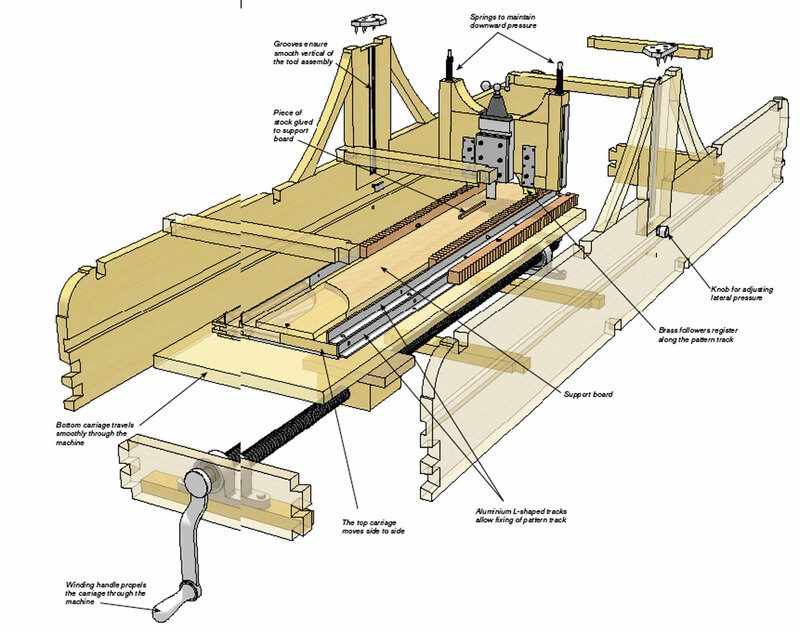 I was also aware of the work of Josephine Erckrath, a student from the University of Linkoping, Sweden, who had attempted to make a working ripple moulding machine. Her generosity in sharing her experience proved very useful. 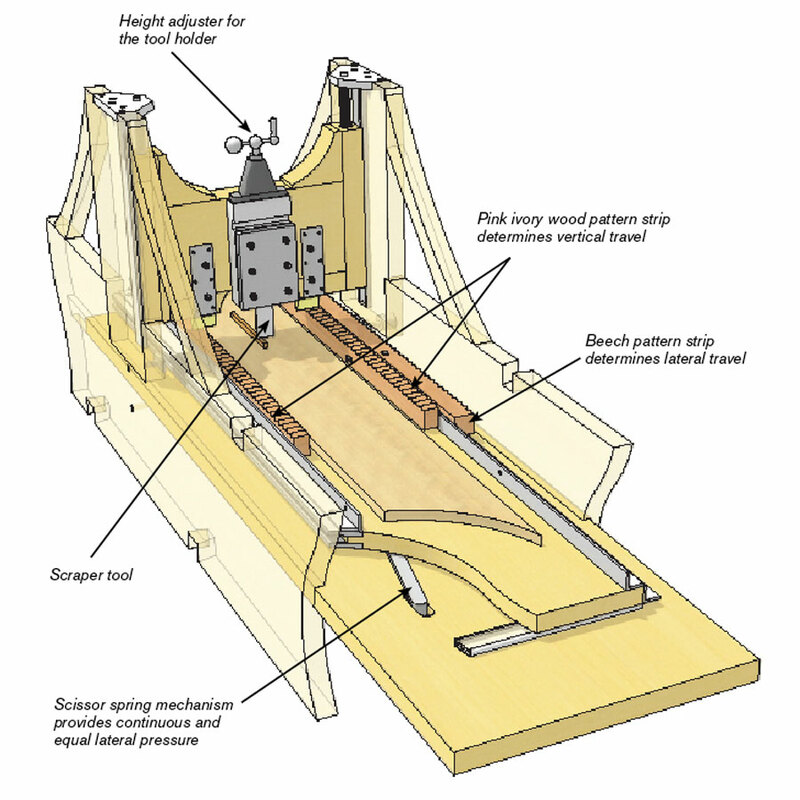 My machine is primarily based on the descriptions and illustrations of Roubo in his encyclopaedic L'Art du Menuisier - The Art of the Joiner - which was published between 1769 and 1774. 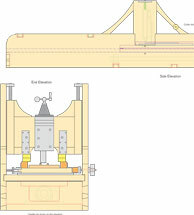 The described apparatus is very similar to those previously published by Andre Felibien (1676) and Diderot & d'Alembert (1765), but the extent of description, and drawing accuracy of Roubo is of greater quality. 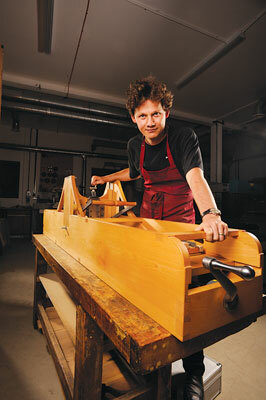 The only weakness of Roubo's work is that he had never seen a working ripple moulding machine, so his drawing was largely based on his expert imagination. 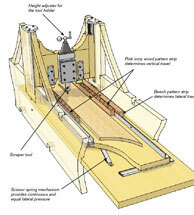 Ripple moulding had its heyday in the 17th-century. 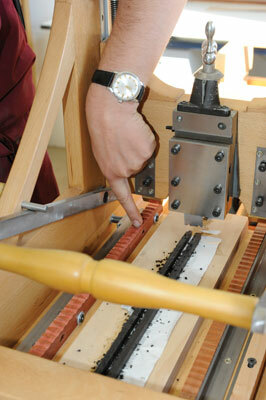 The technique of using a machine to cut a repetitive pattern in wood, in order to create a decorative border, originated from southern Germany. It soon spread to Austria, Italy, Spain, France, Flanders (Belgium) and, of course, Amsterdam. There it acquired its nominal association with Holland, and was forthwith referred to as 'Dutch' ripple moulding. Use of this innovation, which was faster and cheaper than hand carving, was quickly applied to furniture, architectural panelling, and to picture framing. It was particularly used in association with ebony (Diospryos spp. 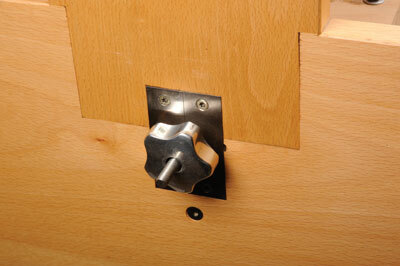 ), a new and highly fashionable wood that was then being imported from the Dutch East Indies. Ebony, with its dense grain, and rich, reflective nature, endowed the ripple moulding with a pleasing, rhythmical reflection of light and shadow. Later, ebonised fruitwood such as pearwood (Pyrus communis), which had a similar fine grain, but was much cheaper, and easier to work with, would be stained dark, then polished to mimic ebony. It was this that would commonly be used to make ripple mouldings. During the first half of the 17th-century, carpenters incorporated the new dark wood and elaborate mouldings into the designs of their furniture, giving rise to a fashion for ebony cabinets. The earliest dates from the 1600s, and a new form of carpentry slowly emerged that was distinct from that practised by the common joiner, making solid wood furniture. These specialist practitioners were known as cabinetmakers or, in French, menuisiers en ebene - carpenters in ebony - from which the present term for a French cabinetmaker, ebeniste, is derived. Many of the cabinetmakers working in France came from the Low Countries (Holland and Flanders), and were attracted by the emerging Parisian market for luxury goods. 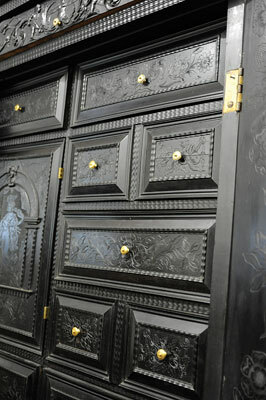 As a result, considerable quantities of ebony cabinets were produced in France, Holland and Belgium that were almost indistinguishable from each other. 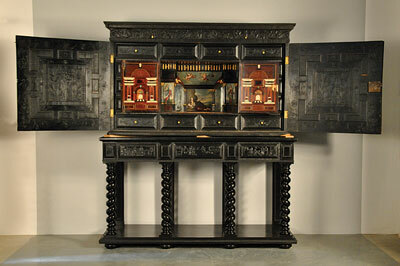 Ebony cabinets fell out of fashion after 1660, as taste veered towards smaller, more delicate French marquetry furniture. 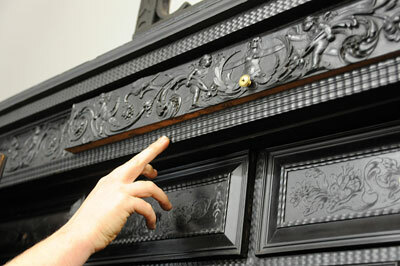 It's hard to find evidence of any ebony cabinets being produced after 1700. The present cabinet dates from c.1650 and is French in origin. It's similar to other cabinets currently attributed to Pierre Gole (c.1620-1684), a Dutch cabinetmaker who worked in Paris. 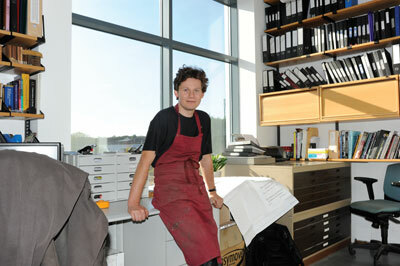 Credit should go to Michael Pohl, a German conservation student, to whom I assigned the actual making of the machine. Our first step was to copy Roubo's plan, however it was soon clear that this was inadequate. Considerable ingenuity was necessary to overcome practical obstacles in order to achieve smooth and regular movements of all elements. Moving the cutting tool up and down, following a pattern was relatively easy thanks to the use of precise linear guides, and with pressure provided by springs. 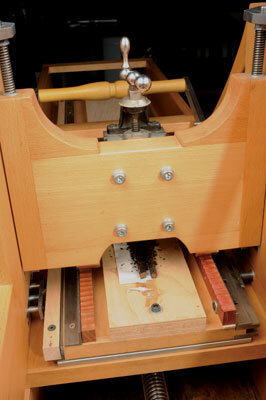 An old compound table purchased on eBay became the perfect tool-rest for fine adjustments. What proved more difficult to move sideways in a predetermined pattern was the horizontal table. To resolve this, two horizontal tables were created as an improvement on the original design. The first table moves simply forwards and backwards with the turn of a hand wheel, while a second table on top of the first one, and on which the piece of ebony is temporally glued, moves sideways. In early trials, using linear guides, the second table moved fairly well, however once the cutting tool applied pressure on the second table, its movement became sticky and inconsistent very quickly. This was resolved with a handmade crossbar mechanism inspired by the scissor forklift. Having achieved satisfactory working movement of the various elements, the last difficulty was to create a cheap wood template that would sustain continually repeated pressure and movement. Templates made of metal would have been ideal, but the cost of making one unique and special metal pattern for one or two mouldings was unrealistic. The solution was to abandon beech (Fagus) for the numerous offcuts of pink ivory lying around in the workshop. Hard and smooth in texture, pink ivory was the perfect material. The pink ivory template could easily be created using the router. 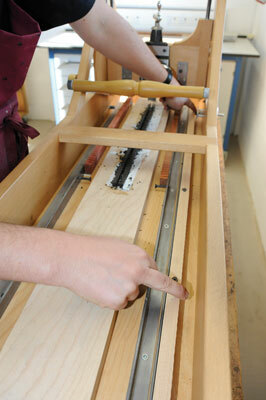 Making a modern reproduction of the ripple moulding machine turned out to be more challenging than first expected. Thanks to large doses of patience, imagination and mechanical ingenuity, we now have a fully working ripple moulding machine. However, while it's now working well, we have also discovered how laborious and slow the process of cutting mouldings with a hand wheel and scraper is. The next step would be to fit an electrical motor and move the technique of ripple moulding forwards into the 21st-century. Since moving to new premises, Yannick has turned over some of his ground floor workshop to include a bench rental scheme. Yannick studied cabinetmaking and marquetry for six years at the prestigious Ecole Boulle in Paris, a school which specialises in teaching the skills required for manufacture of the decorative arts. His aim is to make furniture of unrivalled excellence. He makes use of some of the most exotic and luxurious materials, and his furniture is made using both traditional and innovative techniques. 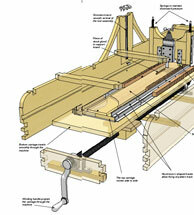 Marquetry plays an important part in all his designs, as does mechanical ingenuity.